Countries pursuing low-emission development strategies (LEDS) aim to grow their economy while reducing greenhouse gas emissions, increasing resilience to climate change impacts, and achieving social development and environmental goals. Kenya has developed policies that align with these LEDS outcomes. Kenya’s single largest private investment in history is the Lake Turkana Wind Power Project (LTWP)—the largest wind farm on the continent. 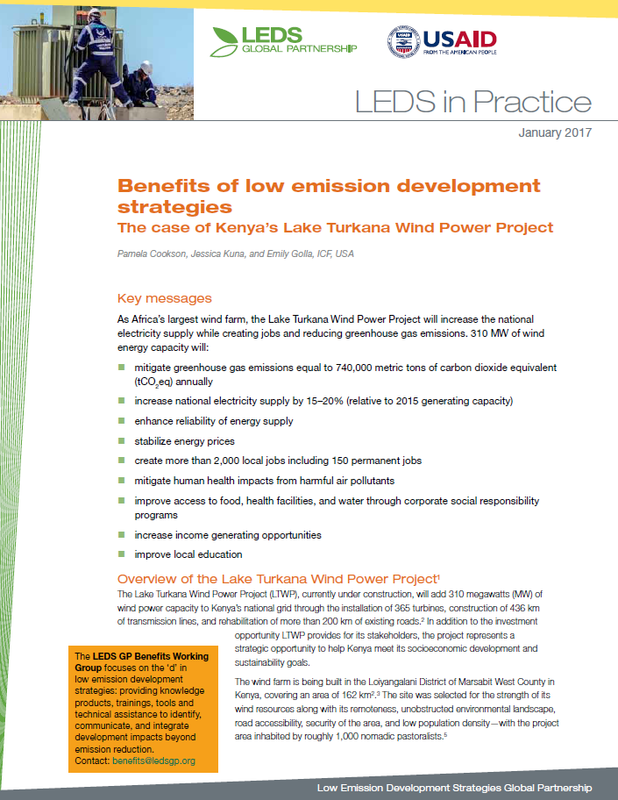 Quantifying the direct and indirect benefits of this project is challenging, but also critical to understanding how low-emission development strategies (LEDS) can help countries achieve national development objectives beyond greenhouse gas mitigation—such as energy security, job creation, and improved human health. Kenya’s heavy reliance on hydroelectricity production has made the country vulnerable to climate change impacts, such as drought and erratic rainfall patterns.